Roger Family Sailing Adventures: Back to the boat! We drove straight from the airport to the Blue Pearl - a little under an hour. We are not allowed to work on the boat in the yard so we've hired a contractor to buff and polish and then to apply our new bottom paint. His quotes were quite reasonable so we decided to let someone else endure the fumes in the heat. It looks fantastic! We've never seen the hull so polished. All of our summer purchases were waiting for us in the marina office. Our stomaches flipped a bit when the new prop didn't fit on the shaft... but once we oriented it correctly it slid on perfectly. We have a bunch of inside jobs but it is very hot with no cool breeze so we are concentrating on a few outside jobs that we can do. Once we have moved from the work yard over to the marina we will be able to put up the canvas up to give us shade and get to our inside jobs. We are staying in a B&B near the marina for a couple of days until the boat is in the water. We huddle in our air-conditioned room or sit by the pool. We are working to adjust to the heat and humidity but it is daunting. Spending time in air-conditioned malls and grocery stores is appealing. 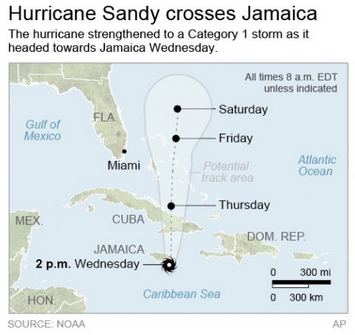 The weather is a result of the remnants of hurricane Sandy that is currently passing over Cuba on its way north. Hopefully we will have clear skys in a couple of days.